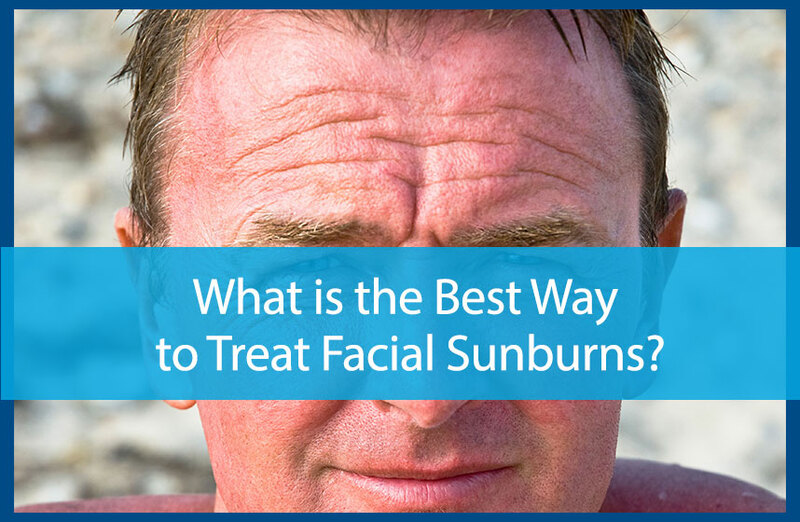 What is the Best Way to Treat Facial Sunburns? Sunburn is frustrating. It doesn’t matter where it happens on your body, or how small of a surface the burn covers—sunburn hurts. What’s worse is that sunburn can actually lead to major health consequences. Sun poisoning and skin cancer are both frequently the result of sunburn, and these are just the long-term consequences. A day or two following your sunburn, pain will be replaced by severe itching, dryness, and peeling skin. While sunburn is bad enough anywhere on your body, when it is on your face there is nowhere for it to hide. Once the skin starts to peel, the healing process will be on display for anyone and everyone to see. This is why if you find yourself sunburned, the best thing that you can do is act early. For immediate relief from the burning sensation, place a cool compress on your face. A cold, wet towel is your best option here. Make sure that you don’t rub your face, as this will hurt against the sunburn. Put aloe on your face as soon as you are able to. The sooner you can apply aloe, the better your skin will be able to recover. Ideally, put aloe on before and after the cold compress. Remember to reapply aloe regularly. Keep your face out of the sun! Just because you already have a sunburn doesn’t mean that you’re immune from getting more or worsening your current burn. Your face is one of the most exposed parts of your body. Keep it safe by wearing a hat and applying SPF before leaving your house. Treating sunburn on your face requires a lot of the same strategies as treating sunburn anywhere on your body. Chances are if you are sunburned on your face, you might be sunburned in other places, too. Staying hydrated is the most essential thing that you can do to help ease your sunburn. When you hydrate your body, you hydrate your skin. Sunburn dries out your skin rather severely, so the more moisture you can send to that burn, the better. Topical ointments can only do so much. If you want to really achieve relief from your burn, you need to be downing a lot of water. Keep in mind that the sun can wreak havoc on your face a lot easier than it can other parts of your body for a variety of reasons. Aside from the fact that your face is typically more exposed than the rest of your body, your face may also be more sensitive. Most skin medications, including acne medications, will make your face more sensitive to the sun. This means your face may burn before any other part of your body does. Prevent facial sunburn by applying SPF before you leave the house. The SPF found in foundation or other make-up is a great start, but for optimal relief you need to use broad spectrum SPF. Then, reapply regularly, especially if you are out in the sun throughout the day. Being proactive and taking care of your skin like this can help save you from a lot of pain later. For more information, reach out to your dermatologist for support. To learn more or to schedule an appointment, contact us at 770-251-5111 today. https://availdermatology.com/wp-content/uploads/2017/07/skininfections.jpg 560 858 John Lenz /wp-content/uploads/2017/08/logo.png John Lenz2017-07-20 15:55:202017-10-03 20:11:14What is the Best Way to Treat Facial Sunburns?